The traditional Career Fair MojeDelo.com returned to Ljubljana in a larger and more prudent form. The fair took place on 18 October in Cankarjev dom – Cultural and Congress Centre located in the heart of Slovenia’s capital. A number of Slovenian and foreign exhibitors were presented at the fair for future employees. The largest Slovenian event of this kind represents the main job market’s juncture where the companies, employers and job candidates meet. The aim of the event is to encourage employment and economic growth in the region. This year, around 100 companies looking for new strengths were presented. Organiser also prepared interesting career lectures and professional career points for the visitors, such as professional photography or career counseling. 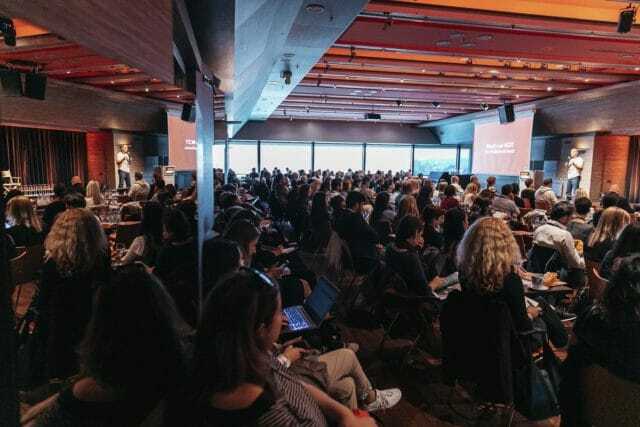 Cankarjev dom hosted 2018 POMP Forum, the biggest content marketing event in Slovenia, for the 9th consecutive year in its Klub CV. PM, poslovni mediji d.o.o., the organiser of the conference, chose the Club CD nine years ago due to its wish of organising a conference away from impersonal conference halls: »We wanted a club space, a lounge where participants would have a pleasant and relaxing time,« noted Anja Garbajs from PM, poslovni mediji. However, the Klub CD’s advantage is not just in its lounge atmosphere: »Due to its terrace providing beautiful sight towards the Ljubljana Castle on one side and towards the Alps on the other, the Club CD guarantees a pleasant socialising over the city,« emphasized Ms. Garbajs. Cankarjev dom makes for an excellent venue for corporative events. This year it hosts diverse corporative events. One of the most important ones in Slovenia is the project Slovenska gazela (Slovenian Gazelle), held by the media house Dnevnik which awards the best and fastest growing Slovenian companies. When choosing the best companies for the award, the jury strives to reward Slovenian companies characterized by rapid growth, flexibility, and dynamic entrepreneurship. The event was this year held in Cankarjev dom’s Linhart Hall (Linhartova dvorana) on the 24th of October and the Slovenian gazelle went to company Mebor, one of the world’s leading manufacturers of machinery for primary sawing of wood.